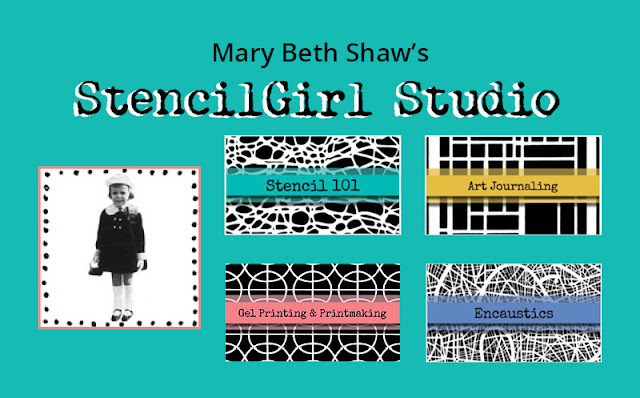 StencilGirl Talk: Grand Opening: StencilGirl Studio! 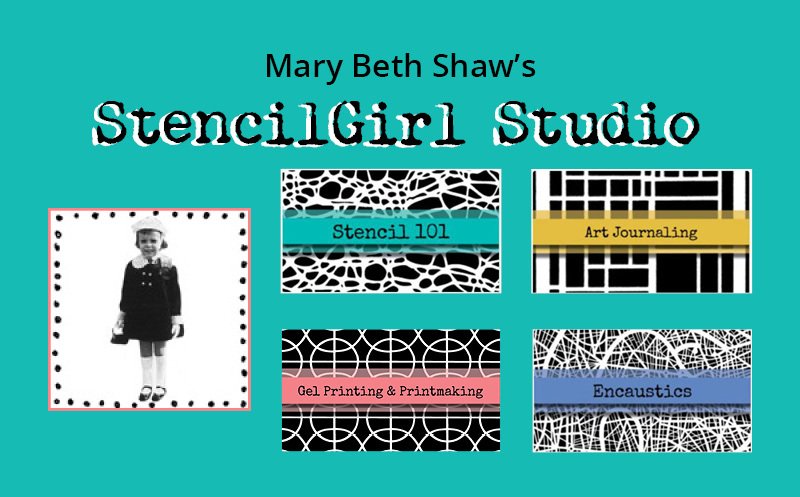 Hey, it's Mary Beth here and I can't wait to tell you about my latest endeavor, StencilGirl Studios. 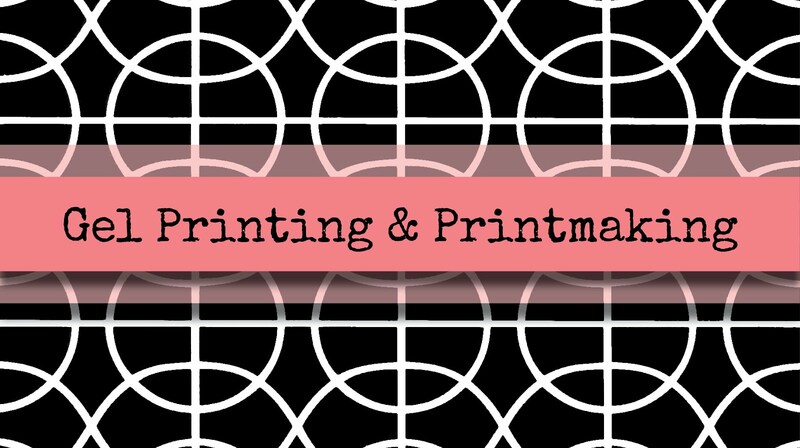 It's a website where you can master stenciling techniques with all sorts of brand new courses. Netflix for stencils, if you will.....this dream of mine has been more than a year in the works as I wanted to get it just right for you! And we will be adding even more courses by myself and other artists in the next few weeks and months. I've been taking online courses for a while now because I wanted to see what was being offered. I specifically structured these courses to be exactly what I want (as a student). We have had the courses available to our StencilClub members for a few weeks now and I have gotten fantastic positive feedback. So what makes these Courses good? The videos are concise! I don't know about you, but the older I get, the more impatient I am. And I can't stand it when I feel the need to fast forward during a tutorial. I know you know what I'm talking about. You won't find that kind of programming on SG Studios because I have filmed concise videos that are edited well. You won't be watching any paint dry here! Professional quality because I hired people to help me. These aren't your usual homespun programming, but polished videos filmed in my studio with lights and microphones. This isn't housed on a blog, but on a real website that is super easy to navigate. 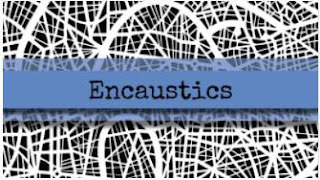 All supplies have been carefully outlined with links to those that are available on our site. Want a preview? Each class has a little preview, so you can get an idea of what it is like (although the real classes don't have any music playing while I talk, that's just during the preview). You get a chance to crawl into my head and it's not as scary as you might think, hehehe. When I take classes, I love knowing the hows and whys of decisions that artists make and I have tried hard to share my thought process during each video. 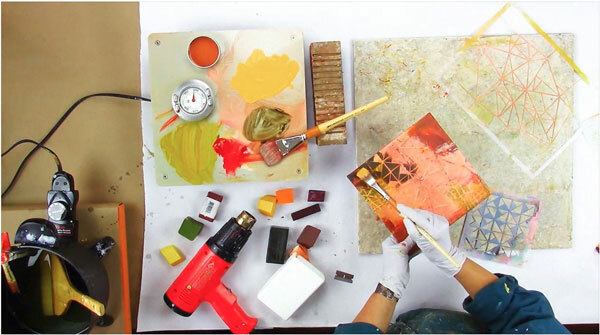 The videos include Stepped Out Projects in addition to a multitude of fresh stencil techniques. Once you buy the course, you can start watching immediately. You can binge watch if you want. You will be able to watch the videos and read the articles as many times as you like. If I add any new material to a course, you will get to watch the updates at no extra charge. 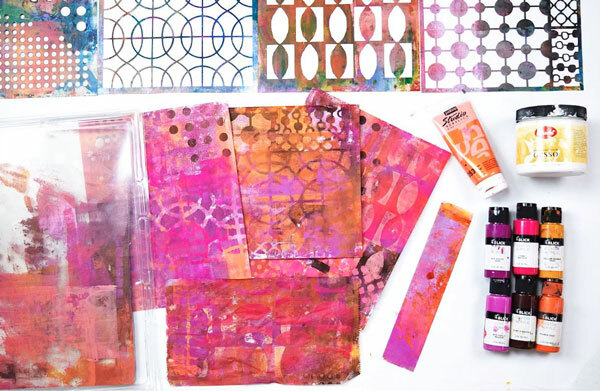 I am thrilled to reveal these 4 courses, available right now: Encaustics, Art Journaling, Gel Printing & Printmaking, and Stencil 101! I have been painting with Encaustics for about seven years and still get thrilled at all the potential involved in painting with wax. 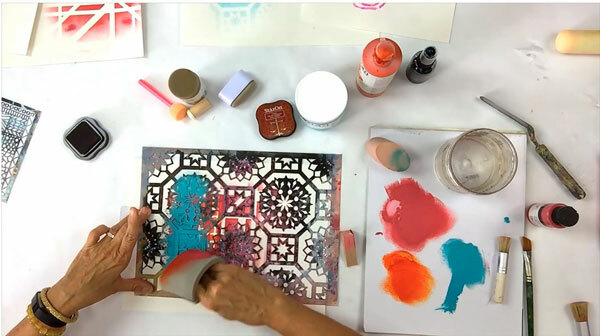 This is a beginner to a mid-level course that is geared for the student who wants to explore the basics but also longs to move beyond and to include stencils in their repertoire. 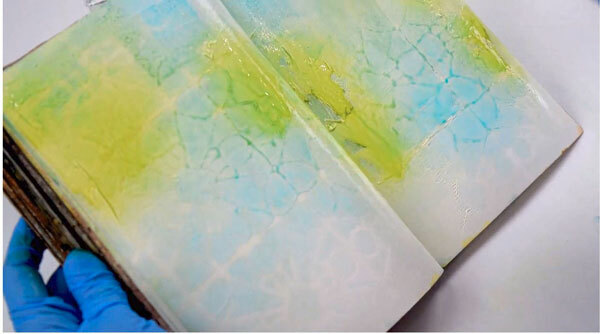 Students will learn to paint 'hot and smooth' and also 'cool and textured'. Safety issues are also covered. 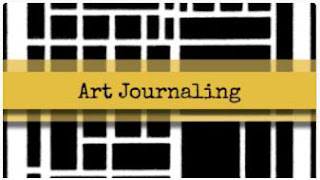 Warning viewing Mary Beth Shaw's Art Journaling course may cause viewers with the sudden urge to play in your own art journal, but I encourage you to watch the course all the way through. You may want to take notes as this course is jam packed with info and techniques. This course was a feast for the eye and a wealth of information. 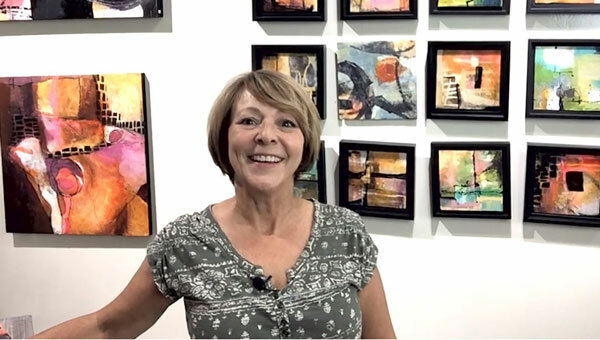 You can always count on Mary Beth to tune your eye, stretch your imagination, and help you make the leap from craft to art. 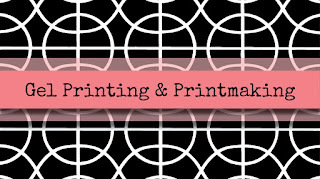 I have been working with stencils for many years and as I watched Stencil 101 I learned NEW STUFF! 1. Sofft sponges are not just for Pan Pastels 2. Layer colors immediately - if my sponge is dry enough 3. Other tidbits that I am glad I got to review again. 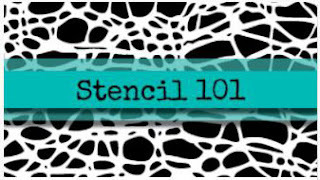 Stencil 101 is a bargain at $9!